Ever find yourself wishing you had more storage on your iPhone, iPod, or iPad? 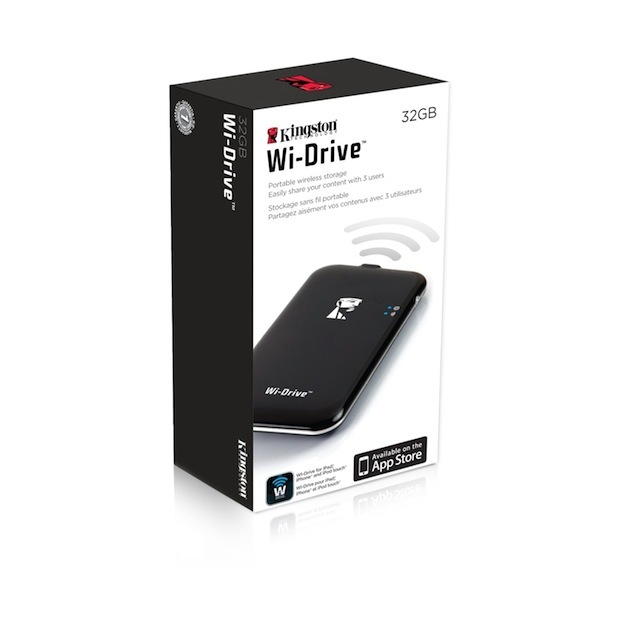 Kingston feels your pain and has released their new Wi-Drive USb 2.0 portable hard drives with 802.11g/n wi-fi allowing up to three Apple devices to wirelessly connect at the same time. WPA/WEP security means you can lock down access to the files on your Wi-Drive and according to Kingston the internal battery will run for approximately four hours of continuous use. Configurable access point name (APN) means you can set the network name of the drive to whatever you want and a dedicated app is available to download from Apple’s App Store. Theoretically, with an Apple TV, an iPod Touch, and one of these Wi-Drives you should be able to wirelessly stream HD content from the drive to your HD television using AirPlay. We may need to pick up a Kingston Wi-Drive to test this theory! Comes in 16GB and 32GB flavors.